Many of the commercial TV and radio stations have their towers up here as it is the high point for the area at 2,323 ft. As you may notice in the lower photo, the rain had temporarily cleared out the smoke but you can see it building up again from the fire to the east which is on the right. I learned that I need to carry an easily deployed wheel chock since I don't have a parking brake. I do have folding chocks in case I need to remove a wheel but they are packed with all of the tools. Sunday evening was spent looking for a different kind of geocache. The GPS coordinates just gave the starting point followed by directions following compass bearings. They were careful to specify using an uncorrected magnetic compass followed by distances ranging from 90 feet to 0.23 miles. It ended with 77 paces into the woods following your compass. It felt like we were following a pirate treasure map. We found the ammo box in the woods right where they said it would be but the distances were more difficult to measure. I was using the Nike+ app to measure distances which used GPS. A simple pedometer would probably have worked better as that is what I think they used. The distances listed were always shorter than what I came up with. 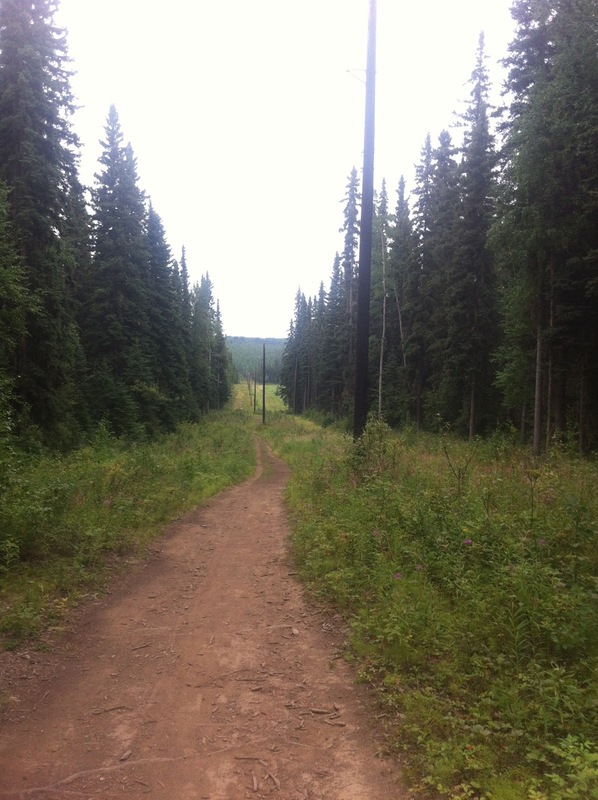 Fortunately, the distances were usually to trail intersections so we were able to figure out where we needed to be. This photo was taken along the trail leading down to the "T" Field behind the university. The starting point was the Large Animal Research Station so this geocache was good for a few miles of trail walking. Nothing wrong with that. Geocaching certainly has something adventurous to it in you neck of the woods. I am thinking more along the lines of treasure hunting. I don't know about adventurous but it is something to do while out and about. My brother in-law has found thousands all over the world including quite a few in Germany. This one was more like treasure hunting since the GPS was only used to locate the starting point. After that is was compass headings and counting paces. I set up some around the University as an Technology Day activity. You find all of the caches and pick up a poker chip from them to trade in for something. Usually a USB drive or something like that. 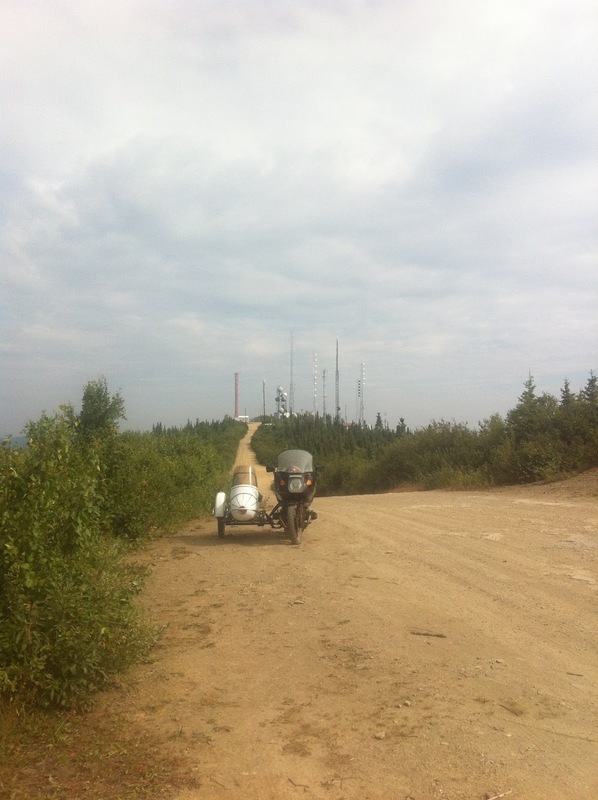 Geocaching and a ride up into the hills. Good stuff. We hiked around a few waterfalls this weekend. it's good for you, whether you huff and puff or not. We don't have too many waterfalls around here. There are a number in the canyon just north of the Denali National Park entrance. Now that's a great area for a ride. I agree about smoke and exercise- they don't mix. Nice photos- make me want to be there. 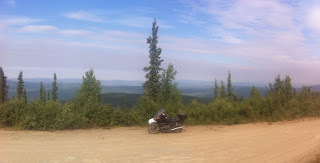 The small panorama is of the Goldstream Valley which is the next valley north of Fairbanks. In spite of the appearance, there are quite a few people live out here but many of them are in cabins. This was the first time I've rode up Ester Dome on the motorcycle. I've biked, walked, ran and driven up but never with the motorbike. It is a really nice view from up there. Richard I'm sure having the sidecar makes that loose gravel a bit more palatable but it still looks like ATV country to me. Glad you had fun with the cache ... as my friends and avid geo-cachers say, it's all about using billions of dollars of satellite equipment to find tupperware hidden in the woods. It would have been a pretty bumpy ride but I regularly stand on the pegs while riding on dirt and gravel roads as its much easier on the body having your legs as part of the suspension. Plus it's easier on the bike suspension as well. Since my RT has limited suspension travel especially with the sidecar installed, standing has become more useful and is used often. I like your friends description of geocaching. Excellent! Sounds like a fun day. So do you do any benchmark hunting as well? Not recently, though I used to it often both while working with geologists in the field and afterwards while hiking or climbing. I will check it out, thanks for visiting and leaving a comment.